In a sense it is a tragedy that most Alsace wines from 2008 will be comsumed way to early.This vintage gave wines with high levels of noble acidity - tartric acid - as well as excellent aromatic complexity and moderate sugar levels. There is only one advice to give - stock up! 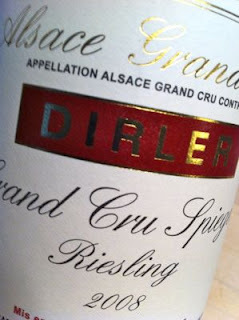 2008 Riesling Grand Cru Spiegel from Dirler-Cadé in Bergholtz is medium golden yellow. The aroma is huge with mano, honey, pineapple, apple sauce and a whiff of rubber. The taste is like an iron fist, loaded with layers of focused fruit and sandy structure of acidity. No perception of sugar whatsoever. Those who have patience will be richly rewarded. Price: €18. Agreed; stock up with 2008. In Sweden my favoutite at present is René Muré's Côte de Rouffach. I heard that it is very good. Muré has all the skill and great terroirs, so everything is in place. I need to go to see them next time I am in Alsace.